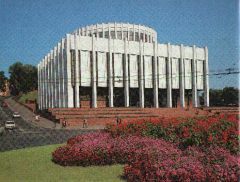 This museum is a branch of the Central Lenin Museum opened in Moscow in 1936. The Kiev branch was set up in 1938 and is currently housed in a new building erected in 1982 in the centre of the city at the starting point of its main thoroughfare — Khreshchatik Street. A broad granite stairway leads to museum building, faced in white marble. Monumental sculptural reliefs — The Hymn of Emancipated Labour — decorate the corners of its facade. The new premises do not have the usual exhibition halls as the exhibits are arranged throughout the entire space of its three floors. The documents and materials in the museum (about 8,000 items in all) tell about the life and work of Vladimir Lenin, the outstanding revolutionary and thinker who founded the Communist Party of the Soviet Union and the world's first socialist state. Vladimir llyich Ulyanov (Lenin) was born on April 10 (April 22 New Style), 1870 in Simbirsk (now Ulyanovsk). The first section of the exhibition is devoted to Lenin's childhood and adolescence, and to the beginning of his revolutionary activities (1870-1893). The photographs in this section show views of Simbirsk on the Volga, as well as Vladimir Ulyanov's parents and his brothers and sisters. The materials show the atmosphere of friendship and mutual respect that reigned in the family, their public interests, and reveal the children's personalities — all of them became professional revolutionaries who devoted their lives to the emancipation of the working people from oppression and exploitation. Having finished secondary school with a gold medal, Lenin entered Kazan University, one of Russia's oldest universities. A number of exhibits is devoted to Lenin's studies at the university which were interrupted by his arrest and subsequent banishment to a village (December 1887) for taking part in student protest meetings. This section of the museum also illustrates Lenin's stay in St. Petersburg where he took an external degree at the university's law department. Having made a thorough study of works by Marx and Engels, Lenin became a convinced Marxist. This section also contains materials on Lenin's revolutionary propaganda activities in Samara (now Kuibyshev) where he organized a Marxist circle. The following section introduces the visitor to the St. Petersburg period of Lenin's activity (1893-1900), his participation in a Marxist circle, and his associates, including progressive workers. At that time, Lenin came out against the ideological opponents of Marxism whose political stands he criticised in a number of works, in particular, in his illegally printed and distributed book What the "Friends of the People" Are and How They Fight the Social-Democrats, which he wrote at the age of twenty-four. Photographs and other materials deal with Lenin's trip abroad in the spring of 1895 and his relations with the first Marxist organisation in Geneva created by Georgi Plekhanov (1856-1918), a talented theoretician and propagandist of Marxism. Back in St. Petersburg, Lenin set out to unite the local Marxist groups into a League of Struggle for the Emancipation of the Working Class (1895) which became the nucleus of a revolutionary party of the proletariat. Lenin's League was the first organisation in Russia to combine socialism with the workers' movement. There is a photograph of Lenin with the members of the League. An adjacent map notes the cities in which social-democratic organisations were established on the example of the St. Petersburg League; there are photographs of activists of the Moscow, Kiev, Yekaterinoslav (now Dnepropetrovsk) Leagues and a leaflet issued by the Kiev League for May Day in 1897. On December 9, 1895, Lenin was arrested and then exiled for three years to the village of Shushenskoye in Eastern Siberia. The museum exhibits a scale model of prison cell No. 193 where he was confined for 14 months in St. Petersburg, a copy of his interrogation record, and Lenin's prison photograph. A group of exhibits is devoted to his exile in Shushenskoye. In exile, Lenin wrote over 30 works, some first editions of which are on display. Among them is the fundamental study, The Development of Capitalism in Russia (1899), which was to play an outstanding role in the development of Marxism. While in exile, Lenin wrote the brochure The Tasks of the Russian Social Democrats, in which he substantiated the necessity of creating a party and its platform. The first congress of representatives of Marxist organisations was held clandestinely in Minsk in March 1898. It adopted a decision on establishing the Russian Social-Democratic Labour Party (RSDLP). From its inception, the party insisted on uniting politically conscious workers of all nationalities of the country. The materials on the preparations for the congress are singled out in the exhibition. However, the party lacked as yet the nature of a single centralised organisation. For this purpose, Lenin believed, there had to be an All-Russia newspaper which would play a decisive role in uniting all revolutionary forces. In 1900, as soon as his term of exile expired, Lenin set about organising such a newspaper. After preparing the groundwork in Russia, he went abroad to publish the paper. A photograph shows Lenin with members of the editorial board of Iskra (The Spark). Next to it is the first issue of the paper and a scale model of the printshop in Leipzig where it was published (the model was presented to the museum by workers from the German Democratic Republic). The materials of this section show the tremendous role the newspaper Iskra played in firing the revolutionary movement in Russia. Among the exhibits are issues of the Iskra with articles by Lenin; a brochure on the May Day celebrations in Kharkov with a foreword by Lenin; a photograph of a group of peasants from Kharkov Province who were jailed for unrest; and a photograph of a group of students of Kiev University who were forcibly conscripted into the army for their involvement in the revolutionary movement. A first edition of the book What Is To Be Done? (1902) is on display. This is the work, in which Lenin developed the fundamentals of a revolutionary Marxist party of a new type and was the first book to be published under the pen-name Lenin, which from then on became his party name.